In this image from NASA's Dawn spacecraft, bright material extends out from the crater Canuleia on Vesta. This image was obtained by Dawn's framing camera on Oct. 25, 2011. A NASA spacecraft orbiting the huge asteroid Vesta has snapped amazing new photos of the colossal space rock, images that reveal strange features never-before-seen on an asteroid, scientists say. The new photos of Vesta from NASA's Dawn spacecraft highlight odd, shiny spots that are nearly twice as bright as other parts of the asteroid — suggesting it is original material left over from the space rock's birth 4 billion years ago, NASA officials said today (March 21). With a width of about 330 miles (530 km), asteroid Vesta is one of the largest and brightest objects in the main asteroid belt between the orbits of Mars and Jupiter. NASA's Dawn probe has been orbiting Vesta since 2011 to study the space rock in unprecedented detail. "Our analysis finds this bright material originates from Vesta and has undergone little change since the formation of Vesta over 4 billion years ago," said Jian-Yang Li, a Dawn participating scientist at the University of Maryland, College Park, in a statement. "We're eager to learn more about what minerals make up this material and how the present Vesta surface came to be." Li and his colleagues unveiled Dawn's new views of Vesta today at the 43rd Lunar and Planetary Science Conference in The Woodlands, Texas. 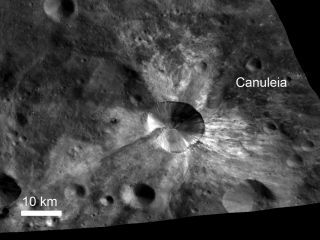 "Dawn's ambitious exploration of Vesta has been going beautifully," said Marc Rayman, Dawn chief engineer at NASA's Jet Propulsion Laboratory in Pasadena, Calif., which oversees the mission. "As we continue to gather a bounty of data, it is thrilling to reveal fascinating alien landscapes." Dawn mission scientists suspect the bright patches on Vesta were exposed during violent collisions with other space rocks. These impacts may have spread the bright material across the asteroid and mixed it together with darker material on Vesta's surface, researchers said. Astronomers have known about variations in Vesta's brightness for some time. Photos taken by the Hubble Space Telescope before Dawn arrived at the asteroid also revealed the bright patches. This mosaic from NASA's Dawn spacecraft shows dark material near a series of craters known as the "snowman" on Vesta. That ejected material is a complex mixture of components. They likely include both dark material thrown out from the craters during the impacts that created them (ejecta), and darker melt that occurred during the impact. The images were obtained from Oct. 11 to 16, 2011. But only the close-up photos from the Dawn probe have revealed the surprising variety of dark blotches on Vesta, which appear as dark gray, brown or reddish blemishes, NASA officials said. In some views, these darker spots are small deposits near impact craters, while in other photos they appear in larger concentrations. These darker spots on Vesta may also be the result of collisions on the asteroid, researchers said. Slow carbon-rich asteroids may have created some of the smaller dark material deposits without carving out a big crater. Meanwhile, faster objects may have potentially slammed into Vesta so hard they melted the big asteroid's crust, which could have also created the dark spots. NASA launched the $466 million Dawn spacecraft in 2007 and Vesta is only the first stop of the spacecraft's two-asteroid tour. Dawn arrived at Vesta in July 2011 and is expected to spend about a year there before heading off to its next target — the even larger asteroid Ceres, which is also classified as a dwarf planet. Dawn is expected to arrive at Ceres in February 2015.